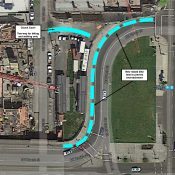 Holladay St project: From carfree to… compromised? an excellent east-west bikeway on Holladay. 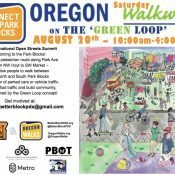 If you’ve been paying attention you know that the City of Portland is coming up against considerable opposition in their quest to make even modest improvements to bicycle access in the Lloyd District. We’ve detailed the opposition leveled at the City by the Central Eastside Industrial Council over the re-allocation of space on NE 12th Avenue. 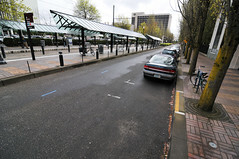 Now opposition has also reared its head on NE Holladay Street, where the the proposal to remove 33 on-street parking spaces faces opposition that could derail the entire project. But today, that vision is long gone. 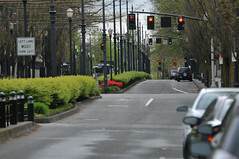 At the outset of the process, the City of Portland Bureau of Transportation staffer assigned to the project made it clear that a 100% carfree Holladay Street was off the table. The reason? City traffic engineers said an analysis of the street showed that it’s crucial for “circulation” and that many property owners would put up a fight if they could not retain motor vehicle access to their parking garages and properties. While PBOT decided to not propose a completely carfree street, the leading option under consideration was partial motor vehicle closure of some sections in order to create a comfortable and pleasant bikeway that would become a crucial east-west spine in the network. But now, real estate company Ashforth Pacific has surprised project staff and stakeholders by saying they do not support the removal of any parking on Holladay. “We have some important stakeholders who are property owners and future developers,” is how PBOT project manager Ellen Vanderslice put it at an open house for the projects held last week. A parking analysis completed last week says the total lost revenue for the parking spaces from Grand to NE 11th would total only $12-13,000 per year. The Stakeholder Advisory Committee is holding a meeting today to discuss this project. It’s from 3-4:30 at the Skybridge Conference Rooms inside the Lloyd Tower at 825 NE Multnomah. The meeting is open to the public and anyone concerned about the direction this project is headed should attend. 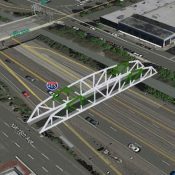 Learn more about the project on PBOT’s website. Dicey. Not to harp on Oregon too much, but it’s not easy having a business here due to various taxes, etc. Portland most likely wants to hold on to the businesses that are located here (which hopefully provide jobs, and therefore more workers, and therefore more taxes), and so PDX business owners get some serious pull. Except that the commonly repeated refrain that Oregon has high business taxes doesn’t hold up to scrutiny (http://www.ocpp.org/cgi-bin/display.cgi?page=issue040123). Businesses are always going to complain about taxes, regardless of how low they are. Businesses are always going to complain about anything which they perceive as negative, regardless of whether or not the perception has any basis in truth. And no matter where a business is located, they are going to find a reason to say “It’s hard to do business here”, whether it’s in Portland, Vancouver, Houston, Guadalajara, or Shanghai. It’s all part of the game. As far as Holliday is concerned, taking away 33 parking spaces is not going to have any measurable impact on the bottom line of any of these businesses. However, road congestion does and will continue have an impact on their bottom line. That is a very real problem. This metropolitan area cannot build its way out of increasing traffic congestion with more and/or wider roads; it must have fully funded alternatives to take the pressure off the roads. The Portland Bike Plan is one small part of the solution, of which the Holliday project would have been one tiny step. It is disappointing that neither the City nor the businesses in the City are willing to take even that step. Not only is everything andy said right, but taxes play absolutely no role in deciding where to locate a business. HQ? Yes. The Factory? Maybe. Hell no. You don’t say “I’m not going to open the Gap in Oregon because taxes are too high”. “If I want to sell to the sizable market that is Portland, I will have to take home a slightly smaller profit because their taxes are higher”. You locate your business where the shoppers are, not where taxes are low. Why open your Gap store in Nome, Alaska, with low taxes, when the customer base is in a city with high taxes? Why do business locate in Times Square, with some of the highest rental rates in the world? And high taxes? And restricted parking? Because that’s where the customers are. Ah, a stake holder advisory meeting while most people are busy at work, trying to scrape a living together. I see what you did there, PBOT. Yeah, I thought the same thing – the last meeting was also during the middle of the day. I couldn’t make it to that one, and can’t make it to this one. Unless and until the city is willing to push back, storage of motor vehicles in the right of way (i.e. curbside parking) will continue to trump improvements for cyclists every time. This opposition is starting to look & sound more like a GOPAC/Astroturf national policy strategy to me. As a stakeholder for Clean Air and Livability, I propose continuing the plan for a car-free Holladay St. Must it ALWAYS come down to making money over livability? It does seem odd that Ashforth would care about street parking. Wouldn’t they want less street parking so more people would park in the lots connected to their buildings. Unless they don’t receive money from those lots, but I assume they do, and it’s a higher rate than the meters. Unless they are worried it would encourage more people to bike to work and pay less in parking, but that just seems like a conspiracy theory on my part. Making things even stranger for Ashforth is the fact that they just recently sold off several of their buildings… thus lessening their Lloyd District holdings to just one building. That building has just 7 parking spaces on Holladay. The Lloyd district? Never heard of it. Maybe you mean the parking lot district? Lovely. Looks like local politics has finally started to emulate national politics. Ya know I’d say i would stop spending money in lloyd, but the problem is that I already don’t spend money in lloyd because the whole district feels like an industrial space with dangerous cars, and trucks owning all of the surface road. So if Lloyd ever wants to see my money they are going to hate to get over the automobile. Take a hint from the Pearl. Bikes and public transit are good for developers and the liveability and maybe even something people seek out. I am disappointed that Ashforth Pacific has come out against this. This was a superb idea, a sleepy street that was not a good through street anyhow (for cars) turned in to bike throughway. I am saddened that the LTMA does not have the full support from businesses to get this to work. This feels like a back lash from the 12th street bridge issue, which seems to have irrational opposition to an idea that would relieve congestion and make this a safer throughway for bikes. One more reason to avoid the mall. Support local businesses that want cyclists coming in their doors. This is a key question if candidates want the bike community endorsement. 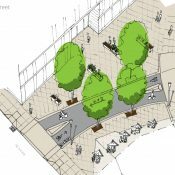 Do candidates support removal of a few parkings spaces when there are parking alternatives and the result is better safety for peds and bikes? PBOT recently installed a pedestrian island, but about 10% of the time it’s a greater risk due to fully legal parking spaces. My hood has plenty of parking 50 feet down the street, so there is no good reason to keep the parking and risk safety. I wonder why this question did not come up with Sam Adams. Car parking is a repeat issue blocking every single bike project. Sue Kiel is out, Tom Miller is in. New York is on the case. Craig, I think Tom Miller has taken the helm. And tomorrow, let’s get the TMA to call out Ashforth (their landlord, unless the 700 Building is one of those that were sold). They should point out that the LTMA has supported – proposed – removal of those spaces with the understanding that it would in some small way reduce their revenue. Heather, if you’re following this, please chime in. You’re right–my bad. I just over a week out of step. Is this another collective step away from “Platinum” by the City? Who in leadership has their hand on the City rudder? It is these smaller collective steps that often are the most important in reaching the longer term planning and policy goals/ objectives the council and larger community have adopted (through a representative democracy). Furthermore, It can be difficult for a project manager to manage a public project if there are conflicting management messages. The loss of on-street parking revenue is an important thing to be aware of (due to bonding against it), but in this case the number of spaces are few and can be made up by demand shifting to other near by spaces (thru higher utilization rates), the replacement by other spaces (conversion of non revenue curb zones – loading stalls, etc. ), etc. …and if not the Lloyd then where? The word on the street is “Avoid the Lloyd”! Guess Ashforth and their friends want to hammer that concept home. And it’s such a backwards point of view when you consider that the Lloyd District is in the heart of the most bikeable part of our city. Ug! Why do we have to keep fighting this stupid battle over and over and over? garble…in other words, the mall is a pain in the rear. Re: Holladay Street. I would be happy if my bike could trigger the lights on this perfect bike route, but they’ve never worked in all years they have been on the street. Why don’t they work? It makes no sense. There is virtually no traffic on this street even during rush hour. The owners of the businesses probably don’t even live in Portland and haven’t a clue about our way of life. BTW, my comments above this one were supposed to be in response to the “parking lot district” comment which I thought was funny.